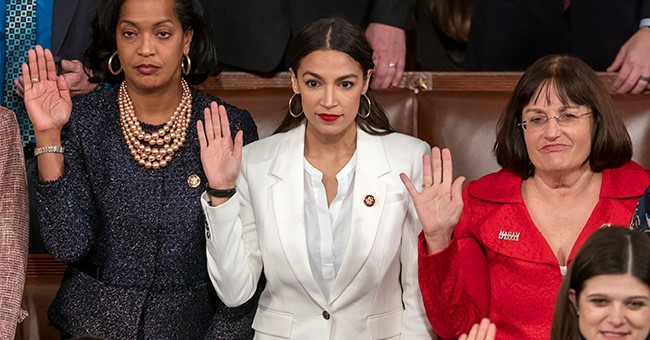 On Friday night, Democratic Socialist Rep. Alexandria Ocasio-Cortez illuminated her relative lack of knowledge regarding world history once again by invoking the Holocaust in her defense of Rep. Ilhan Omar from what she says is an "explicit attack" from President Donald J. Trump. The commander-in-chief shared a video yesterday evening reminding Rep. Omar and her allies about the tragedy that occurred on 9/11 resulting in nearly 3,000 dead Americans. Rep. Omar has previously diminished the terror attack by Al-Qaeda as "some people" doing "something," which was included in the video. Conservative commentators and pundits across Twitter reminded Rep. Ocasio-Cortez her criticism of President Trump fell short on a number of reasons. "Members of Congress have a duty to respond to the President’s explicit attack today. @IlhanMN’s life is in danger. For our colleagues to be silent is to be complicit in the outright, dangerous targeting of a member of Congress," Rep. Ocasio-Cortez tweeted. Her tweet went on to say, "We must speak out," and included a photo the famous poem by German Lutheran pastor Martin Niemöller about the Holocaust and how dictator Adolf Hitler and Nazi targeted individual groups, eliminating them one by one. Rep. Ocasio-Cortez tagged the Holocaust Memorial Museum in her tweet as well. Young America's Foundation speaker and Daily Wire founder Ben Shapiro pointed out it is both dumb to assert "speech is violence," while also defending a noted anti-semite like Rep. Omar by referencing the Holocaust. Erik Erikson commented that if simple criticism, pretty commonplace in American politics, is now tantamount to calling for violence, then the media is surely in need of a restraining order. The Federalist's David Harsanyi said that Rep. Ocasio-Cortez managed to "belittle both the real victims of 9/11 and the Holocaust. Sen. Elizabeth Warren and Sen. Bernie Sanders also condemned President Trump for his tweet. Sen. Warren said, "The President is inciting violence against a sitting Congresswoman—and an entire group of Americans based on their religion. It's disgusting. It's shameful. And any elected leader who refuses to condemn it shares responsibility for it." While Sen. Sanders added, "Ilhan Omar is a leader with strength and courage. She won't back down to Trump's racism and hate, and neither will we. The disgusting and dangerous attacks against her must end." Here's the video. It features Rep. Omar's words in comparison to what actually happened.